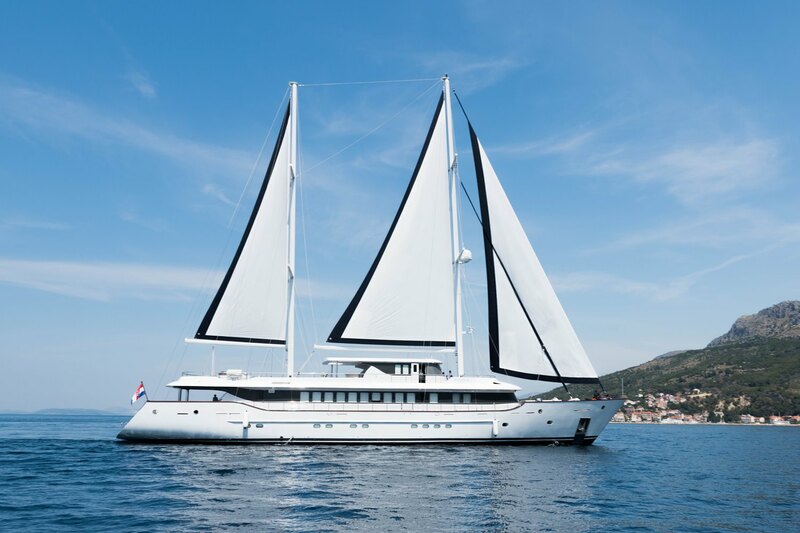 Luxury sailing yacht AIAXAIA was delivered by Brodosplit in 2017 and measures 46m (150ft). 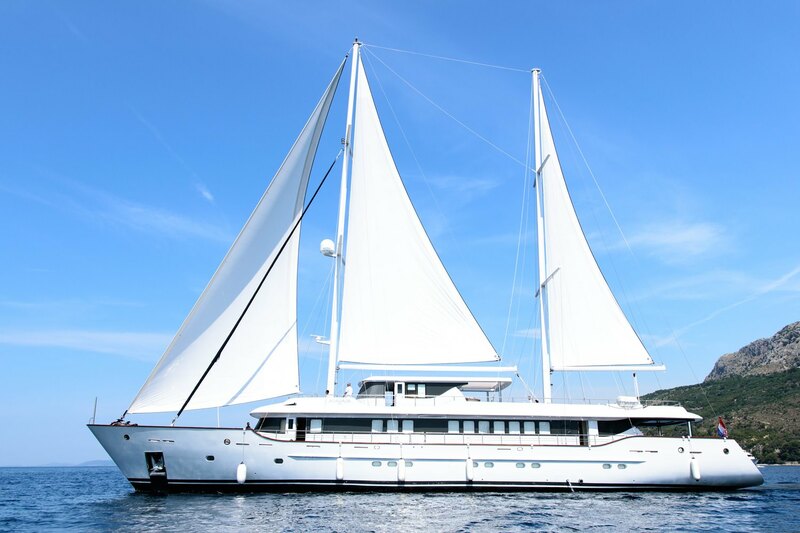 She offers accommodation for 12 charter guests, in 6 well-appointed and spacious cabins. 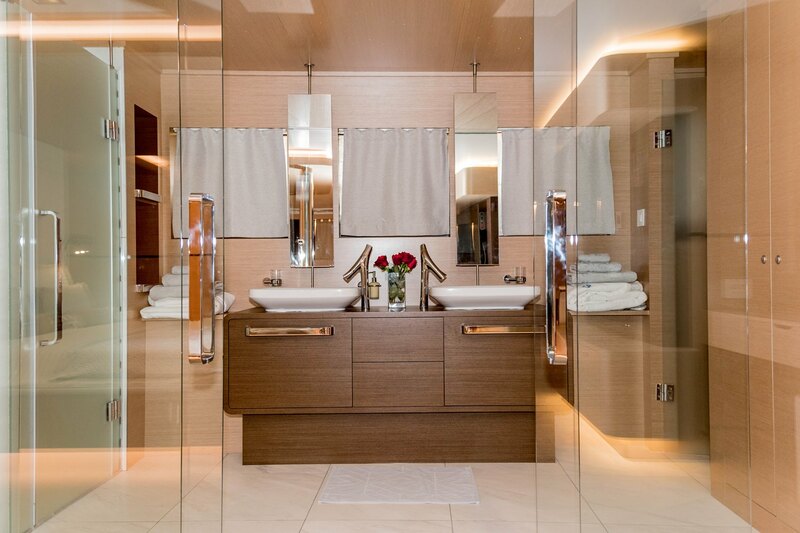 Her interior décor is contemporary and light, ideal for complete relaxation or entertaining. 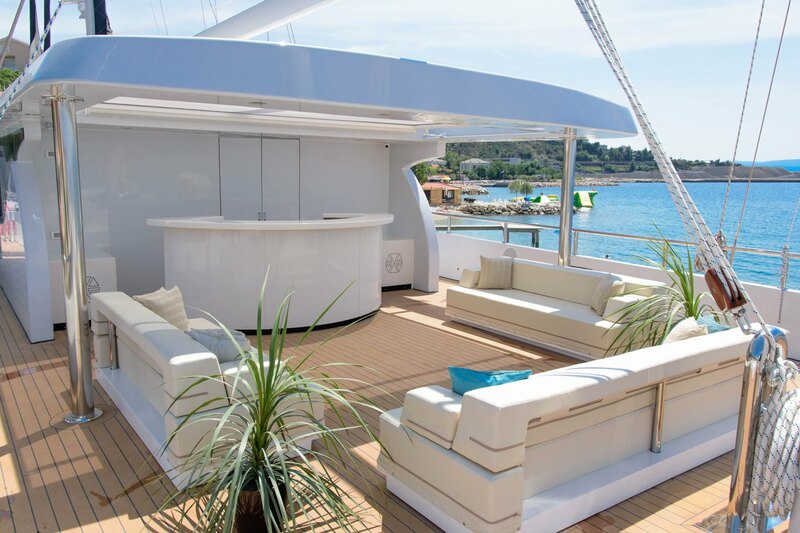 Upon entering the yachts main deck, guests are greeted by a generous lounge, with opposing sofas and wet bar. 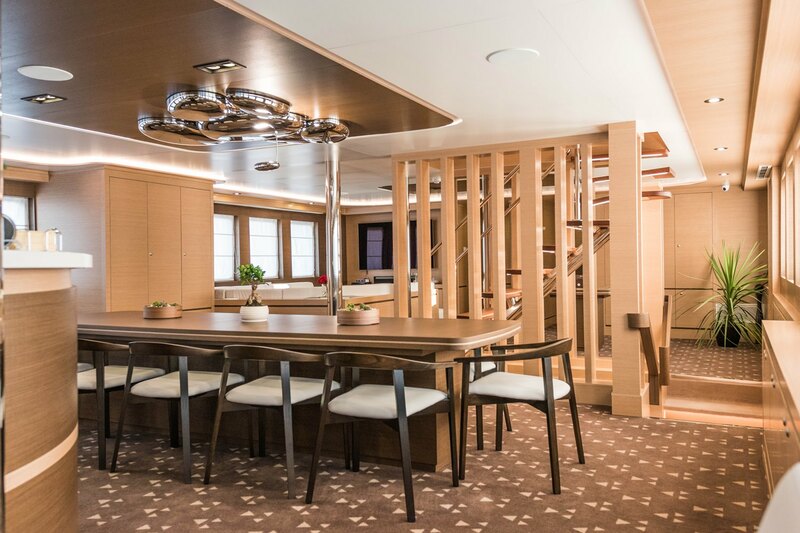 Her formal dining table is situated amidships. 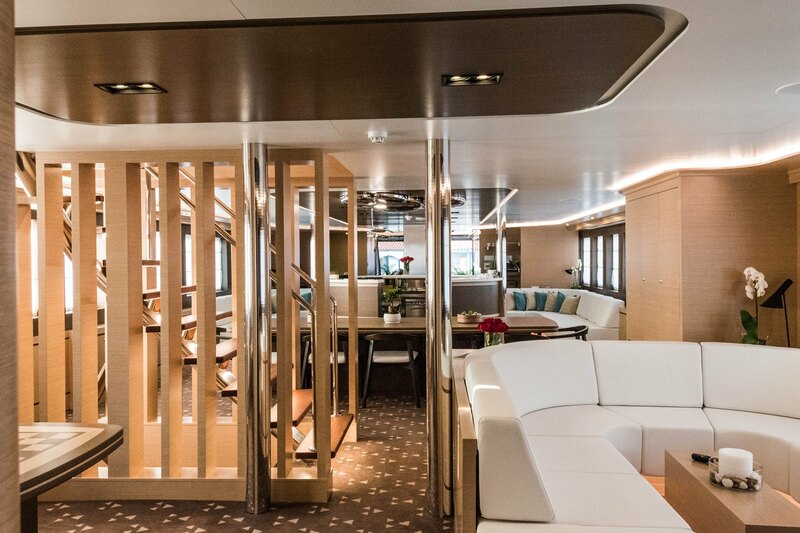 A casual separation leads further forward, where U shaped lounge features TV entertainment, while to starboard is a games table. 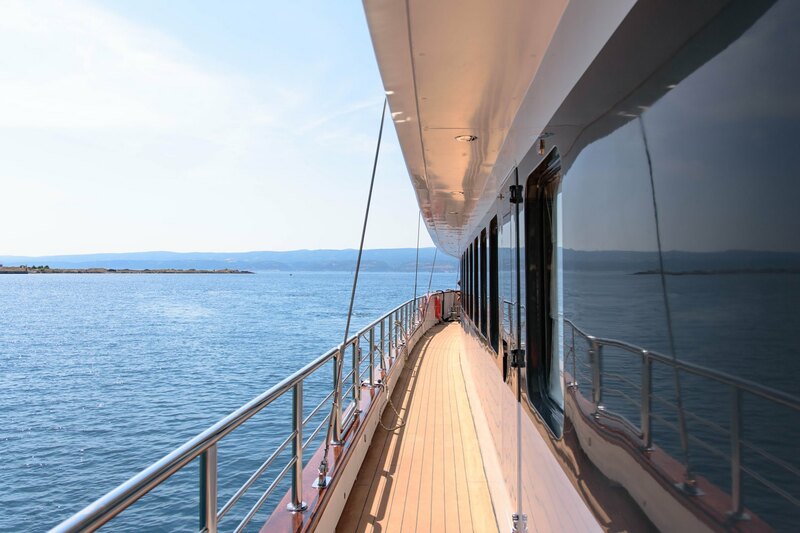 Panoramic windows surround the main deck, ensuring great natural light and endless views. 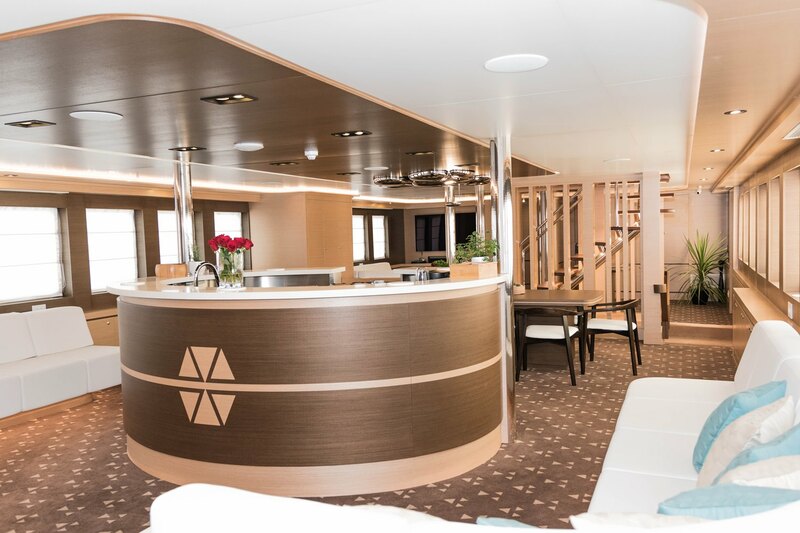 Accommodation is on the lower deck, in 1 master, 1 VIP and 4 guest cabins, each of which is ensuite. 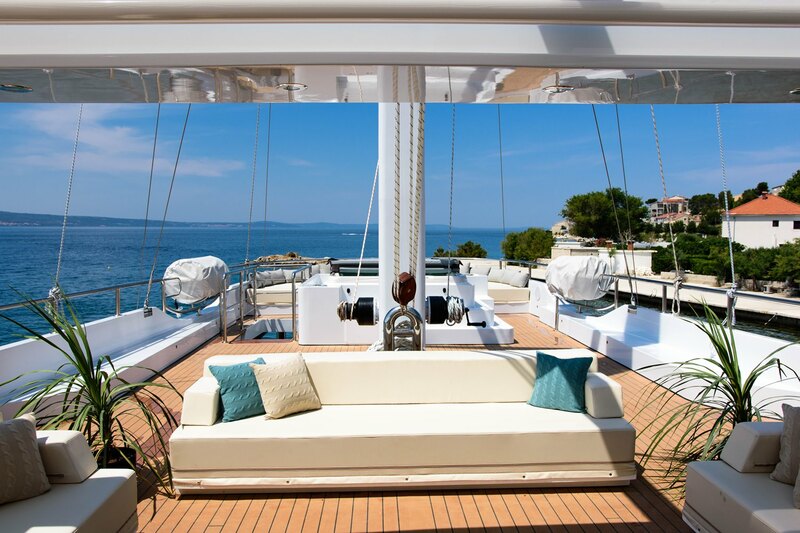 The yachts 2 exterior decks are exceptionally spacious and ideal for any occasion. 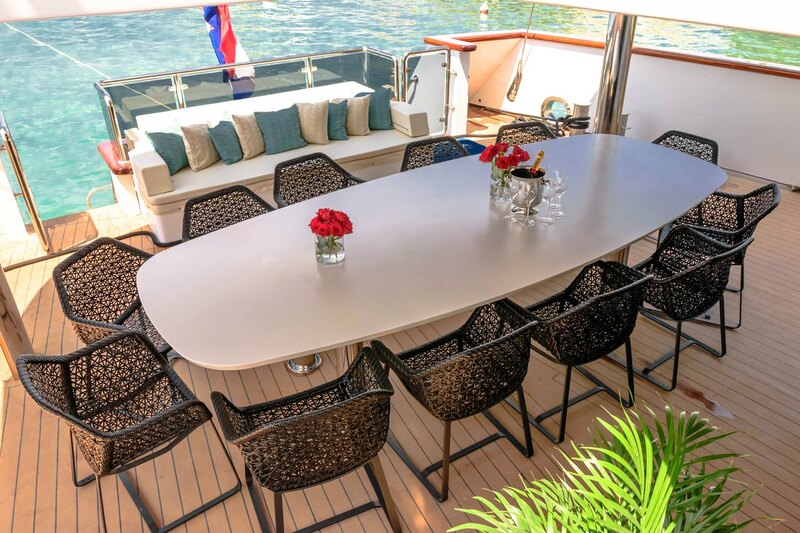 The aft main deck is shaded and boasts an alfresco dining table, seating, direct access to the interior salon, steps to the upper deck and effortless access to the lower swim deck. 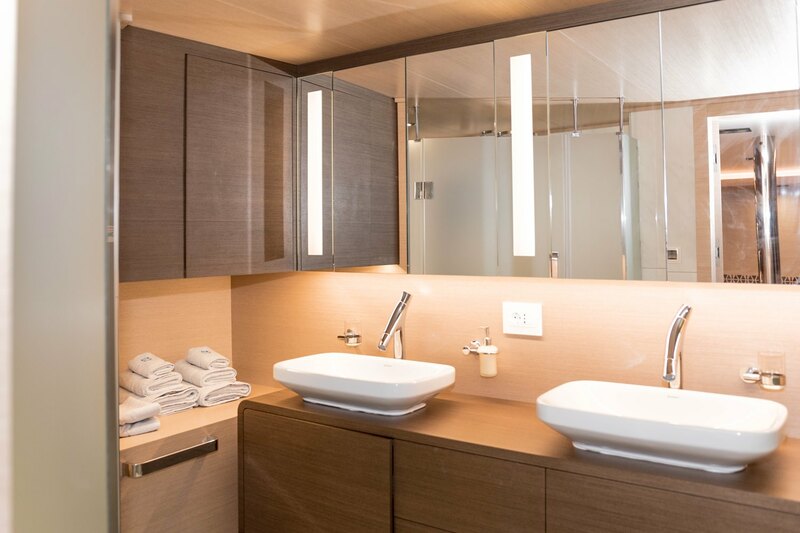 A sauna is available on the port side just at the entrance to the salon. 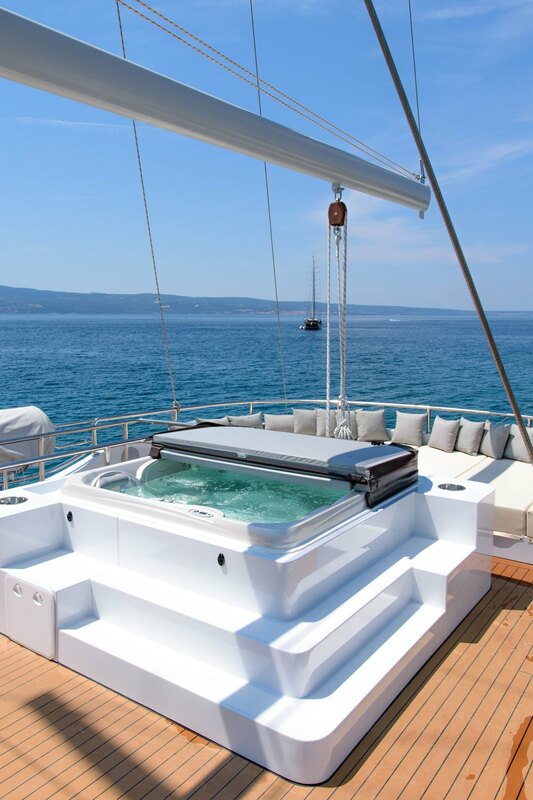 On the upper deck is a deluxe Jacuzzi, 2 large sunpads, a comfortable outdoor lounge with optional shade and a wet bar. Powered by 2 460hp CAT engines, she has cruising speeds of 11 knots. 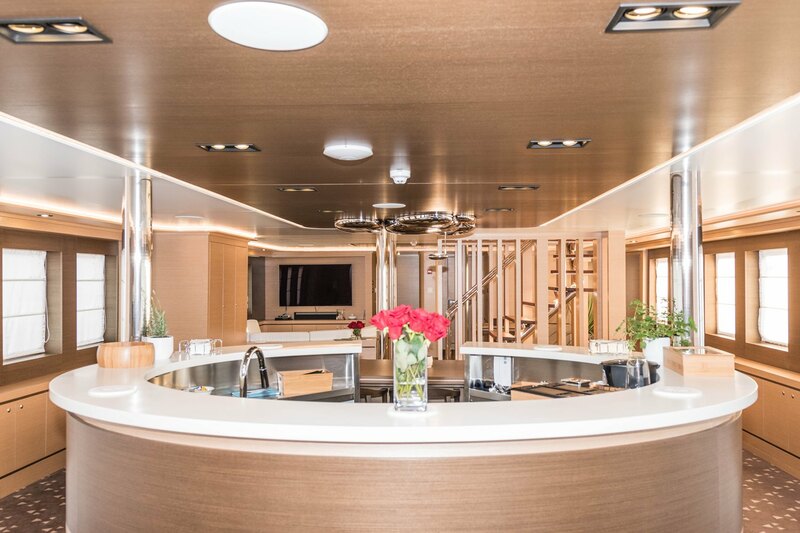 The hull is constructed in steel, while her decks are teak. 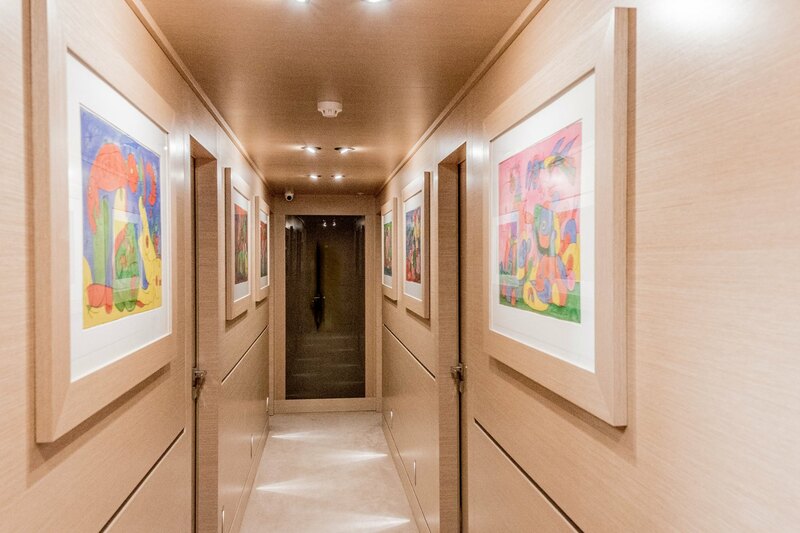 Accommodation is on the lower deck, in 6 ensuite guest cabins. 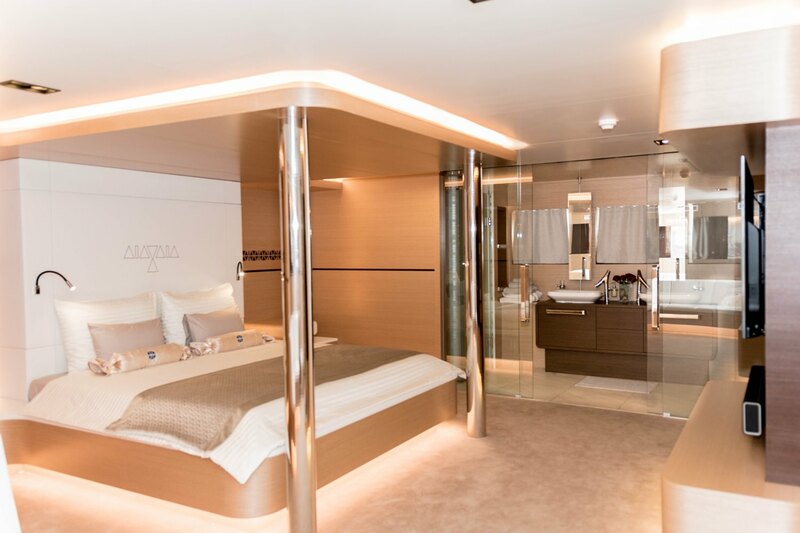 The master stateroom is forward amidships and full beam of the yacht, with a king size bed, lounge, walk in wardrobe and ensuite with his and hers sinks. 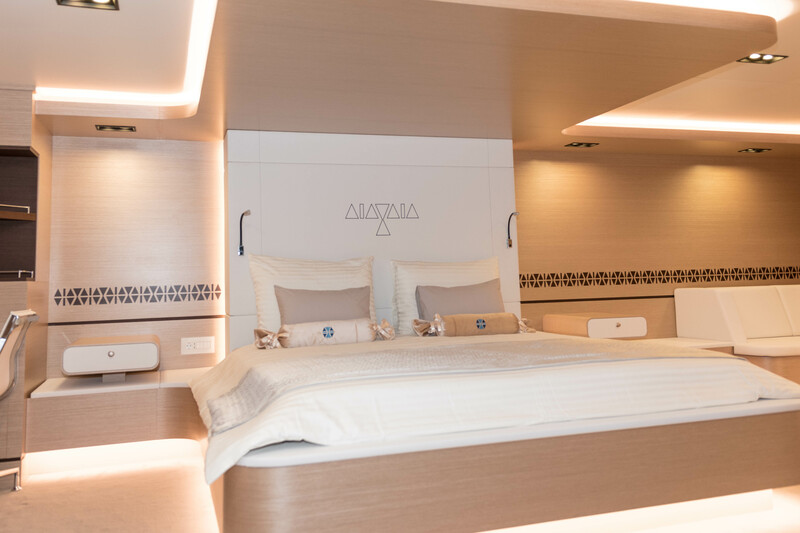 The VIP cabin is aft of the yacht with a full beam layout, king size bed, lounge, walk in wardrobe and ensuite with dual sinks. 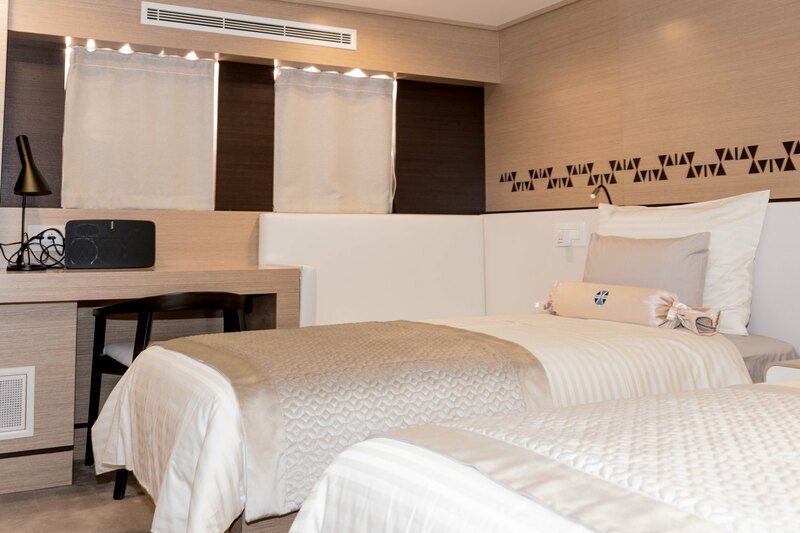 Two cabins each have queen beds, while a further 2 cabins offer twin beds. 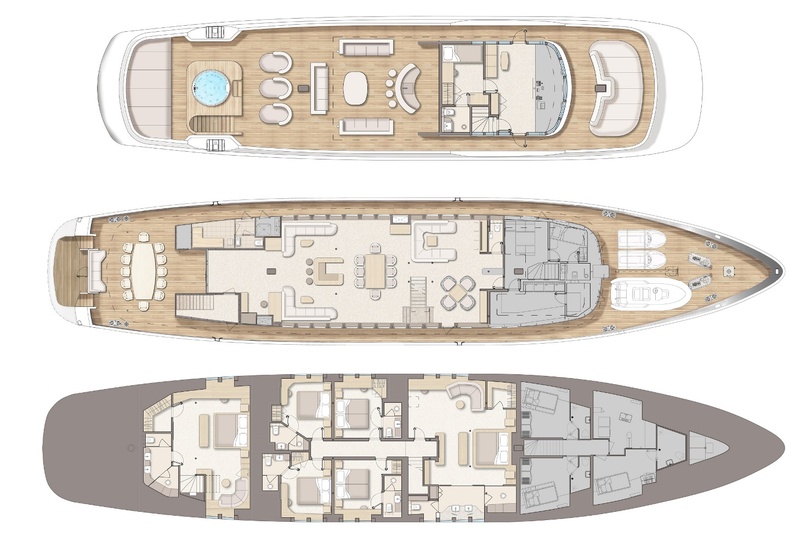 The 2 twin cabins are convertible to queen cabins, making this yachts layout versatile for any group. 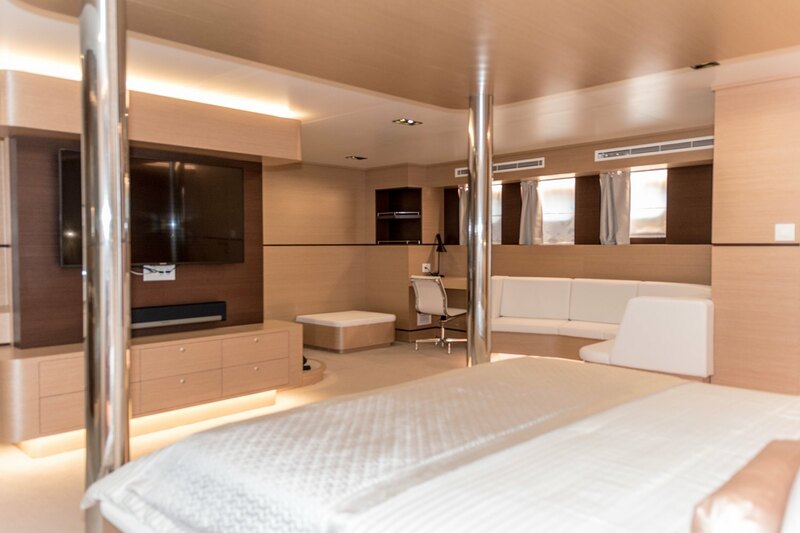 All guest cabins are fitted with a safe, TV entertainment and surround sound systems.